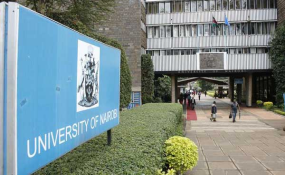 The University of Nairobi (UoN) has emerged as Kenya's higher learning institution that has heavily invested in research, a study by CPS Research International indicates. "Therefore, there seems to be a correlation between volume of research and volume of publications by a university in Kenya," read the study. "From the survey, the top 10 public universities received a total of Sh1.53 billion compared to Sh117 million received by top 10 private universities. These funds were given to universities towards research by government, institutional own funds, and county for the academic year 2018. The study indicate that in the academic year 2017/2018, universities received an approximate value of Sh1.85 billion from government for research. "They also got Sh1.16 billion from industry, donors and other sources. The government thus happens to be the largest contributor of funds geared towards research in Kenyan universities," reads the report titled 'The state of research funding in Kenyan universities' that was released by Herman Manyora, the lead researcher. "From the survey findings, 1.4 percent of all universities did not receive any research funds either from government or from other sources. Again, 4.2 percent of these universities failed to receive government research funds but instead were funded by industry and other donors. It can, therefore, be observed that these universities though few (5.6 percent) point to the state of research underfunding in the higher education sector in Kenya," reads the report. "We have to take research seriously the way other institutions such as multinationals have taken it," said Mr Manyora.